Sat Dec 29 — Russian night — we are looking for volunteers to make baked goods for sale, for more info, please contact David or Reuben. Thanks to all who participated in last week’s discussion. Remember your questions and suggestions are welcome! Saturday, Dec. 15th: No Vespers for this weekend due to the All Parish World Cafe meeting at The Hub. See details below. Please also see World Cafe Plan for more detailed information on this event. Don’t miss this epic event in the life of our parish! As you know, we are leaving St. George’s at the end of January, many major decisions must be made. We need your input in determining the future direction of our parish. Please bring lenten finger foods on a potluck basis (the sign-up sheet is in the Synaxis room). Finger foods are foods or snacks that are easy and not messy to eat (for example: sandwiches (tuna, mushroom, etc. ); crackers, chips and dips (hommos, baba ghanouj, guacamole, salsa); veggies, mixed nuts; cookies and lenten cakes easy to cut up into squares; juice or pop. Tea and coffee will be provided. Please contact Leslee if you have any questions about the food. Reminder — confessions are part of the preparation for Nativity, to schedule a time for confession, please contact Father Vladimir. Reminder — Sat Dec 15 5:30 — 7:30 at the Hub, 1672 Barrington — don’t miss this epic event in the life of our parish!! As you know, we are leaving St. George’s at the end of January, many major decisions must be made. We need your input in determining the future direction of our parish. Note: Fr. Roman will be hearing confessions starting at 3 pm, and will be hearing confessions after Vespers till 7pm. On November 25, we embarked on an exciting path as a community towards a permanent home through the launching of St. Vladimir’s New Home Capital Campaign. All money given to the capital campaign will be used towards building or buying a permanent temple of worship. Join in with the whole community in giving generously, with prayer and joy. Come for a special evening with the whole community of St. Vladimir’s Orthodox Church to discuss and give input into the direction of our parish. With the launch of the capital campaign and need for a place for worship by Jan. 31, we have much to discuss as a community. All voices are needed to be heard. Babysitting and refreshments will be provided. Location: 1673 Barrington St, The Hub Halifax, 2nd floor (http://goo.gl/maps/51NIQ). All Welcome. Saturday July 28, 12noon-4:30pm: Patronal Parish Picnic. Location: York Redoubt, 301 Ferguson’s Cove Road. Come with a family picnic lunch, and energy to play games. Sunday July 29, 10:00am: Divine Liturgy followed by potluck. Please schedule all confessions with Fr. 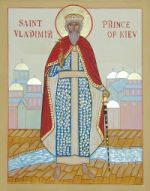 Vladimir in advance (# 483-7492). The last time for confessions before Pascha will be Friday between noon and 1:30. No confessions Saturday, please. Pascha Potluck — following the Paschal Liturgy, we will gather to break the fast and celebrate together. Please bring either food or drink to share, in addition to your Pascha baskets. Pascha Social — on Sunday, April 14 at 4:00 pm, at 34 Kirtland Court, Dartmouth. Please bring a side dish, a dessert, or something to drink. Pascha Decorations — each year, Nancy does a wonderful job of beautifying the church with flowers for Holy Week and Pascha. If you would like to contribute to the cost of this, please speak with her. His Grace, Bishop Irenee, visited St. Vlads for the Vespers of Theophany on the evening of January 18th. 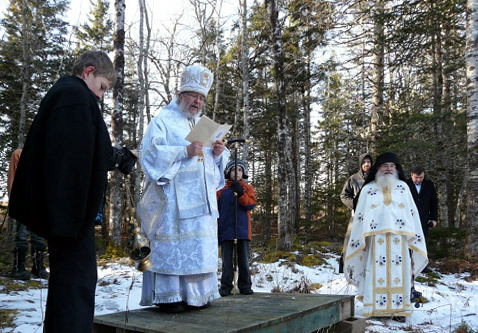 Then, on Jan. 19th, he served the Theophany Vigil at the Hermitage of the Annunciation and blessed the monks small stream. A small group of pilgrims from St. Vladimir’s also attended. Calendars showing feast and fast days, as well as daily readings are available at church. Suggested min. donation: $5. We need a volunteer leader to be a liason between our parish and the soup kitchen leader. Please contact Reuben if you would like to volunteer in this capacity. More volunteers are also welcome.The commitment is one Saturday every 6 Saturdays during the hours of 3pm to 6pm. It is quite fun. Baby sitting is being organized. Please ask D’arcy or Olha for more details about baby sitting.